Anchor Pump offers a wide range of high-quality pumping, environmental,and process equipment for the most demanding of applications to the simplest. We offer expertise and the best equipment for your needs. 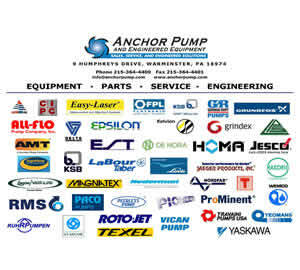 Anchor Pump offers factory-authorized repairs, modifications, and upgrades for all our manufacturers’ equipment. Anchor Sales can repair any brand of pump and rotating equipment. We’re always willing to share our knowledge with you. Free, one-hour “Lunch-n-Learn” product seminars are offered by all our manufacturers. Call us today to set one up for your team. Anchor Pump also offers training in pump fundamentals, operation, maintenance and troubleshooting. Classes can be held on-site or off-site, and are tailored to your needs. Topics include Pump Fundamentals, Pumps and Systems and Pumps for Pits. Anchor Pump provides system design, evaluation, and audits. Do you have a problem pump in your system? Give us a call and we’ll find the problem and offer a solution. Want to know how to reduce your make-up water costs? We’ll show you how. Need a source capture system? We’ll put together the pieces right for your situation. We have knowledgeable and friendly staff members that are ready to help you.